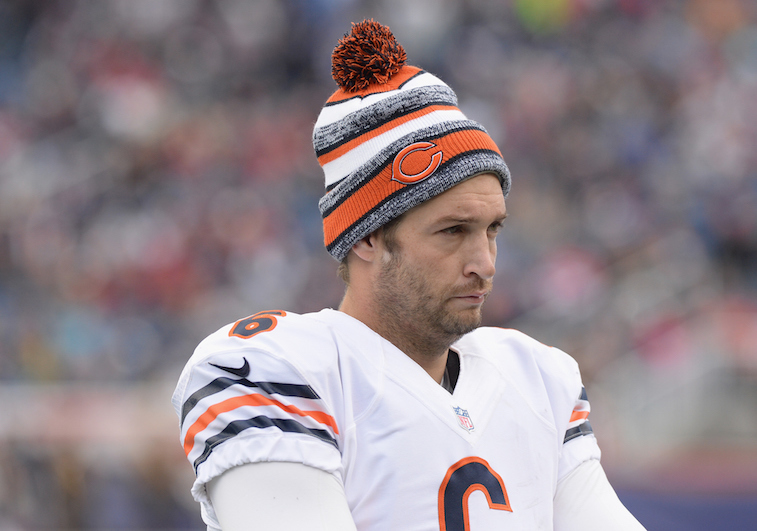 NFL: Is Jay Cutler in Danger of Being Cut by the Chicago Bears? Jay Cutler is arguably the most physically gifted quarterback in the National Football League. The Chicago Bears’ signal caller has one of the strongest arms the game has ever seen, as well as the prototypical size scouts and coaches look for in their quarterbacks. On top of that, Cutler also proved that he was also a top-notch athlete at the 2006 NFL Combine by running a 4.77 second 40-yard dash and putting up 23 repetitions of 225 pounds on the bench press. Those numbers meant that the 6-foot-3, 225-pound quarterback was faster and stronger than several of the running backs and linebackers in attendance. However, raw physical ability doesn’t always translate to success at the NFL level. One could easily argue that Cutler’s combination of arm strength, size, and athleticism closely resembles that of Hall of Fame quarterback John Elway. With that being said, Cutler doesn’t even deserve to be mentioned in the same breath as Elway when it comes to their on-field production during their respective NFL careers. There is actually another player that comes to mind as an excellent comparison to Cutler. As we had previously discussed during the 2014 season, Cutler is beginning to look more and more like a reincarnation of Jeff George – an extremely talented, strong-armed quarterback who turned out to be a bust in the NFL. In fact, New York Jets wide receiver Brandon Marshall, Cutler’s favorite target for six of his nine seasons in the league, actually said that Kyle Orton, of all people, was the best quarterback he’s played with during his nine-year NFL career. Cutler will again be playing for a new head coach – John Fox – and offensive coordinator – Adam Gase – in 2015. 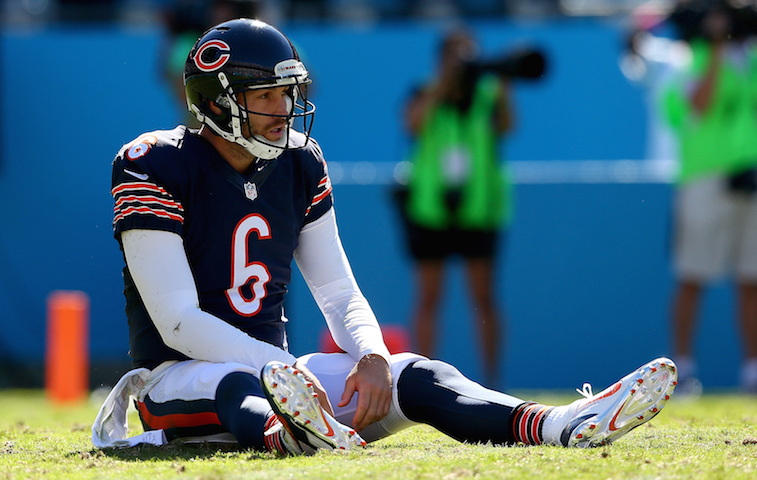 Fox will be the fourth head coach Cutler has played for during his career, and it is his inconsistencies on the field that have been one of the main reasons the other three head coaches – Mike Shanahan, Lovie Smith, and Marc Trestman – all lost their jobs. Knowing this, the Bears have to be asking themselves, when will enough be enough when it comes to waiting on Cutler to reach his immense potential? As you can see, Cutler’s stats haven’t been great, but they haven’t been awful either. What his numbers simply do not tell you is that coming up with clutch performances in big games is not exactly his forte. Furthermore, Cutler has yet to display the types of leadership qualities you would expect to see in a quarterback who signed a $126.7 million contract. As if the above facts weren’t enough, the biggest cause for concern when it comes to Jay Cutler is his postseason record, or lack thereof. In his eight full seasons as his team’s starting quarterback, Cutler has led his team to the playoffs only one time. He also picked up the only postseason win of his career in his lone postseason appearance, but will forever live in infamy for missing most of the second half of the Bears’ NFC Championship Game loss to the Green Bay Packers during the 2010 NFC Playoffs because of a sprained MCL. While his performance on the field has been nothing to brag about, Cutler does have a contract that, up to this point, has guaranteed his spot on the Bears’ 53-man roster. That could all change following the 2015 season. If Cutler struggles to perform again this season, the Bears could opt to cut him and face just $13 million in dead salary cap space in 2016, only $2 million in dead space in 2017, and a mere $1 million in dead space in 2018. Those numbers are far more manageable than the $29.5 million in dead space the Bears would be facing if they released Cutler prior to the 2015 season. Given the status of his contract and the fact that he has yet to really prove anything as a starting quarterback in the NFL, Cutler is without a doubt coming up on a make or break season in 2015. If the new Bears coaching regime proves to be a good fit, we may finally see the version of Cutler we’ve all been waiting on. If he struggles again in 2015, it could be the last we see of the Santa Claus, Indiana native as an NFL starter.